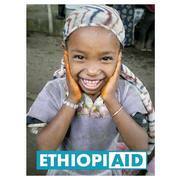 Ethiopiaid works with Ethiopians to help transform their lives. With our amazing supporters we work for an Ethiopia without poverty, in which every person enjoys the right to quality education, healthcare and a life of dignity. We have been working with Ethiopian people for 25 years. We give local people opportunities – through funding – to use their initiative and skills to make the right difference. We send your donations directly to Ethiopia so that they can be spent as soon as they’re needed. We make sure that suitable amounts are sent at the right times and our partners do the rest.